Friends of Acadia will be doing three, Facebook Live, broadcasts on Acadia Day, Sunday, July 8. ACADIA NAT’L PARK — In celebration of Acadia’s second birthday in its second century, Friends of Acadia (FOA) is partnering with park officials, area historians, and some of Mount Desert Island’s most venerable lodging establishments to do a series of live broadcasts on Sunday, July 8, Acadia Day. On that date in July 1916, President Woodrow Wilson signed a proclamation formally accepting the gift of land for Sieur de Monts National Monument that would eventually become the nucleus of today’s Acadia National Park. One-hour, interactive Facebook Live broadcasts are planned for 9 a.m., noon, and 4 p.m., from the Bar Harbor Inn in Bar Harbor, Asticou Inn in Northeast Harbor, and Claremont Inn in Southwest Harbor. The shows will be streamed online on Friends of Acadia’s Facebook Page and will be available in both desktop and mobile formats. 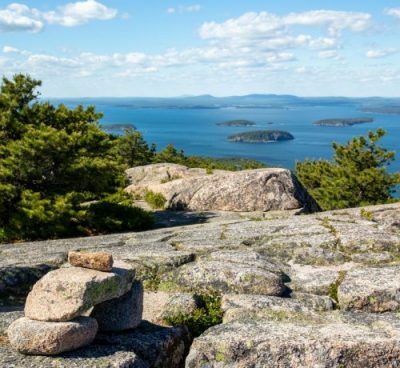 “We thought this would be a fun and entertaining way for people to share their affection for Acadia and get to see their friends and neighbors talking about the place we all love and want to protect so much,” says Lisa Horsch Clark, FOA director of development. “There will be interviews with lots of interesting guests, segments on local history and great conversation,” she adds. The goal of the segments, which are being sponsored by Burdick and Associates Landscape Design is to encourage new memberships as well as renewals. The Skrocki Charitable Foundation has issued a challenge grant and will match all donations made on July 8, up to the challenge amount. Hosts will include FOA staffers Shawn Keeley, Lisa Horsch Clark and Earl Brechlin. Guests slated to appear include historians Joe Marshall, Rick Savage, Ralph Stanley, and Jack Russell, artists and photographers, as well as FOA President and CEO David MacDonald, Conservation Director Stephanie Clement, Summit Steward Coordinator Stephanie Ley, other staff members, Acadia rangers and experts, FOA members and supporters. Videos and still photographs will also be shared. In addition to joining online, membership table volunteers will be on hand at each venue to do sign ups. Everyone who joins on July 8 will be entered into a drawing to win a canvas tote bag filled with Friends of Acadia items, books, and more. To find out more about how you can give back and support Acadia National Park visit friendsofacadia.org/giving-membership. For more information about the Acadia Day broadcasts email julia@friendsofacadia.org.